Timid and shy Kawai Arisa is a normal 14 year old High School girl, except that she is the target of bullies as her family tend to move around a lot due to her parents work. The fact that the Prince of her class, Inogami Yuuki, is the only person who's nice to her, makes another reason for them to pick on her. One day new transfer student Yashiro Akira accuses Arisa of bullying him when she lived in his hometown, but the thing is Arisa has no memory of her life before she fell down the stairs five years ago! Could the timid Arisa really be the tyrant ARISA of the past? Is there such a thing as split personality? What other "memories" will come to trouble her. Okay. At first when I read the synopsis I was definitely thrown over but I decided to check it out. A first, I didn't like the main character but then she turned out to have an amazing alter-ego. A girl who bullies people, self-centered and confident. She had number of servants during that time and then because of her parents jobs she moves and then everyone comes to extract revenge. That's why it's so interesting. I found myself glued to it and I practically enjoyed it. Soon it became too funny. There is romance in it though. The first person who comes to extract revenge ends up helping Arisa(the main character) and he turns out to be Arisa's favorite 'servant'. Then there was Inogami. Before Arisa met her alter ego he was always mysteriously kind to her. So I practically liked the story. It was funny and interesting. I explained much of that already. It was okay but I don't really like that art style. The story takes your mind of the art because it was so interesting. I love Arisa! At first she was annoying but then you meet the infamous Alter-Ego. At first it was alittle confusing but they differentiated it by uses different font styles because in the story the amazing alter ego is written in katakana and the normal crybaby is in hiragana. Simple isn't it. I like the way how tough and interesting the alter ego was. She was a strong willed character and I like that. THIS IS A SERIOUSLY AWESOME MANGA READ IT!!! AND DONT JUDGE BY THE 1st CHAPTER!! At first, Arisa is a weak timid pushover. Making her looks like a thanksgiving feast to the bullies of her class. However, when a new transfer student, Akira tells her he wants to get his revenge on her for bullying him in their childhood, Arisa cannot believe him. To be honest, I couldn't believe him either, but hey, it's a manga, anything goes. 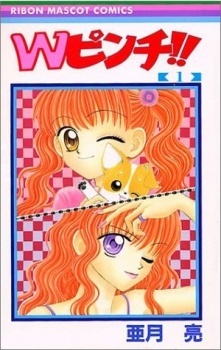 Moreover, since it's a manga, Arisa fell down a flight of stairs and lost all her memoirs five years ago. Anyway, the only one that seems to be kind to her is her brother, and classmate Yuuki, who Arisa has a small crush on. Thus, starting Arisa's crazy life of regaining her memoirs, facing more whacky people who just want to get back at her for "ruining their lives" and dealing with love. This story is really one of a kind. I mean how many mangas are there with alter egos and crazy character out for revenge. That you know, at the end of the day don't get their revenge and are left with even more hunger for revenge for Arisa. I wasn't excepting much of the story at first; I was just looking for another thing to read. Nevertheless, boy, I did not see what was coming ahead in the story. I'll try not to spoil it for you, but the alter ego, the "nice" boy, and the gender bender! Whoa, it was quite a ride. The character really made the story. For one thing, they weren't sticks in the mud. They actually had EMOTIONS, which seems to be lacking in many mangas nowadays. There were many misunderstanding, but eventually those misunderstanding became clear. This manga made me laugh, smile, and brought up my mood. This is really, what I judge in a comedy romance manga.